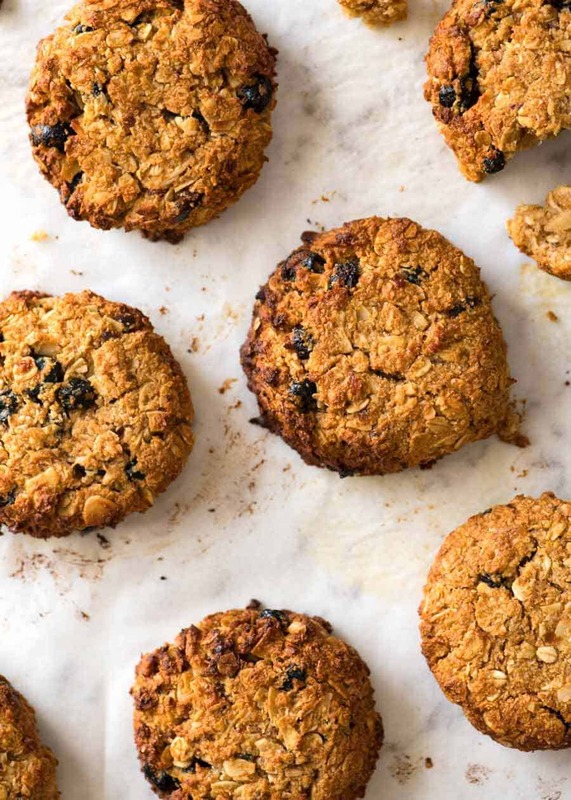 These Breakfast Cookies are like a bowl of homemade granola in cookie form! 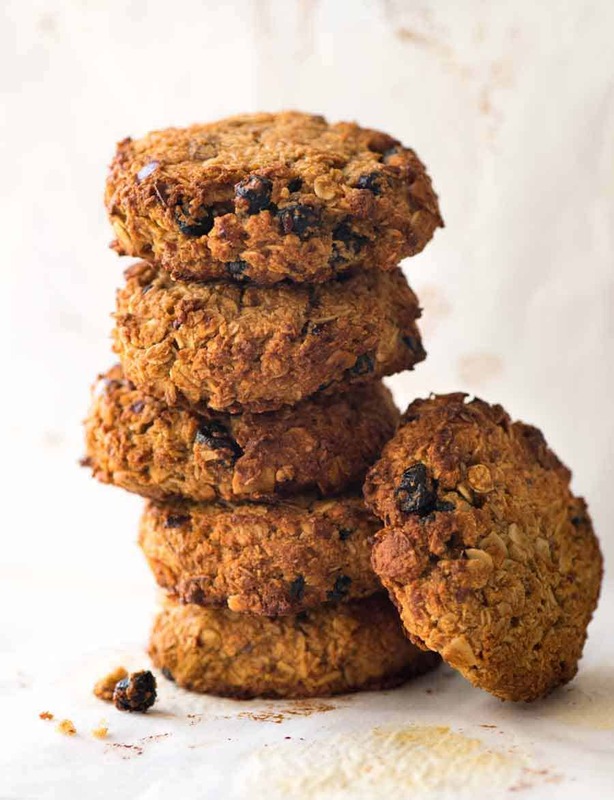 They’re healthy oatmeal cookies that taste like your favourite oatmeal raisin cookies – but they’re refined sugar free, gluten free, and will keep you full for ages. A terrific make ahead breakfast, fill a jar with to grab ‘n run! The only 2 ingredients in these Healthy Oatmeal Cookies that I don’t put in homemade granola are almond meal and egg. So I’m not exaggerating when I say these are like a bowl of granola in cookie form! 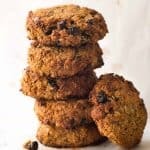 These are a copycat of muesli breakfast cookies I’ve been eyeing at my local coffee shop for years, wanting to make a version that was actually acceptable to have for breakfast. I’ve tried multiple times and they’ve always been meh – the main problem being too dry and hard to swallow. Finally, the penny dropped when I was smushing soaked dates for Sticky Date Pudding. MASHED DATES!!!! Thoroughly unappetising and sludge-like as it looks, this is the secret to sweetness, moisture, colour and terrific texture for healthy sugar-free cookies!!! Flavourings: I’ve used cinnamon and vanilla. Try: orange blossom, almond essence, all spice, cloves – whatever takes your fancy! 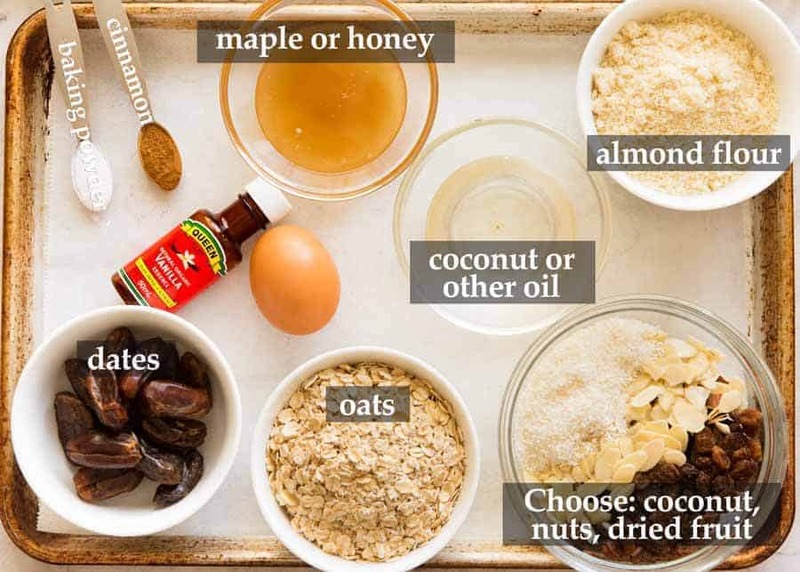 Add Ins: I’ve used coconut, almonds and raisins. Use any combination of coconut, nuts and dried fruit that you want… or CHOC CHIPS!!! Almond Meal: Can be substituted with hazelnut meal / flour. I use these two interchangeably. Do not sub with normal flour – it makes the cookies dry and cardboardy. A HEALTHY BREAKFAST THAT KEEPS YOU FULLER FOR LONGER! One cookie is like having one of those quick oatmeal sachets topped with dried fruit. Rolled oats have a low GI so they keep your fuller for longer, the nuts provide protein and the dried fruit provides fibre and natural sweetness. No added sugar, natural gluten free and just 376 calories. 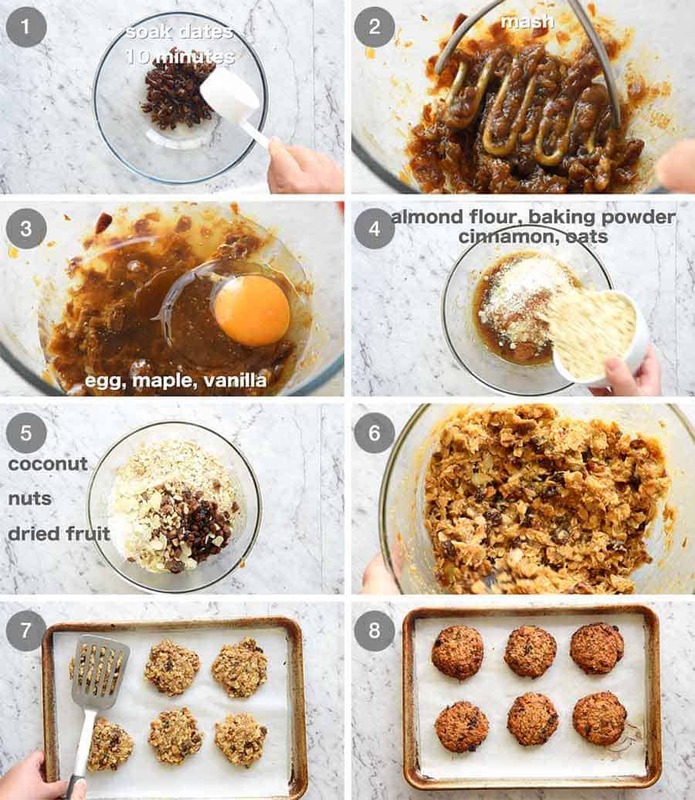 Breakfast cookies are so simple to make, you can make them today for a grab ‘n run breakfast tomorrow!! Soak dates, mash (strangely satisfying, despite how unattractive date sludge looks), mix with remaining ingredients, form cookies and bake. No food processor, no beater – terrifically simple. I’ve made these breakfast cookies hefty instead of wimpy little cookies because they are intended to be a breakfast. 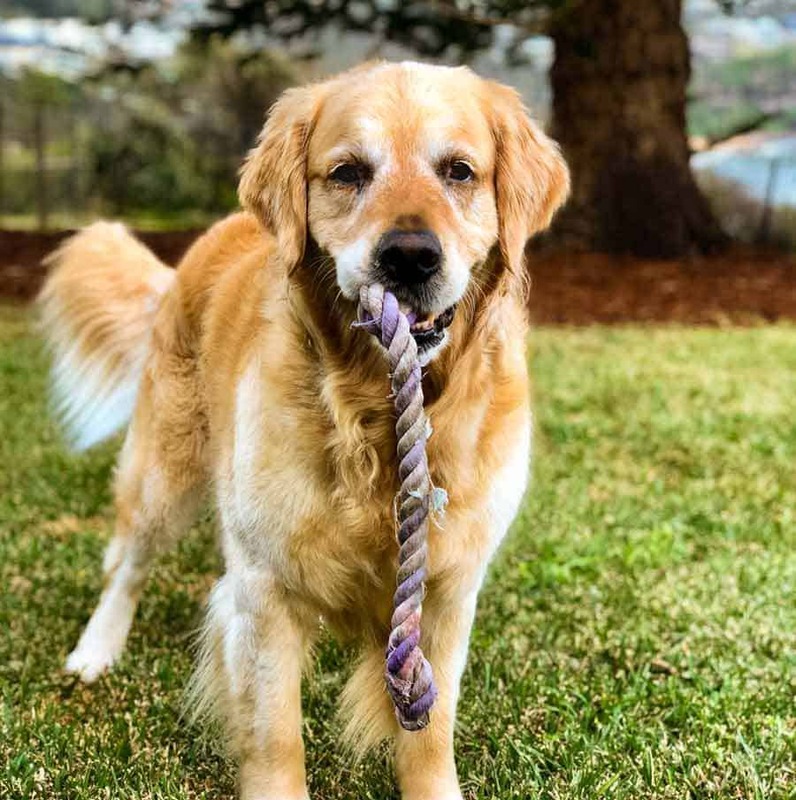 I made the mistake of having two of them when I took these photos and I was full for hours. So full for so long, I didn’t even have a full dinner that night. PS I don’t recommend making them normal cookie size/thickness. They are soft-chewy and lack the crispy edges you find in classic Oatmeal Raisin Cookies, I wasn’t thrilled with the texture. Best chunky and “meaty” – appropriate for breakfast! More Make Ahead Breakfast – Grab ‘n Go! Recipe video above. Like homemade granola – in cookie form! A satisfying grab ‘n run breakfast that tastes like your favourite Oatmeal Raisin Cookies. Same chewy and moist inside (thanks to the mashed dates! ), but not as crispy. And these happen to be healthy! Customisable – see notes. Preheat oven to 180C/350F (standard) or 160C/320F (fan/convection). Line a tray with parchment/baking paper. Roughly chop dates. Place in bowl, pour over water. Cover and leave to soak for 10 minutes+. Mash with potato masher or fork until it becomes a paste. Add remaining Wet ingredients. Mix well with wooden spoon. Add Dry ingredients. Mix until all flour is incorporated – should be a thick batter (see video). Measure out just shy of 1/2 cup (6 cookies) or 1/3 cup flat (8 cookies). Flatten to 1.7cm / 2/3″ thick rounds. (Note 9) Bake 20 minutes until golden. Remove from oven, leave to cool on the tray. 2. Oil: Can use any oil, use a flavourless or neutral one. Or melted butter or margarine. 3. 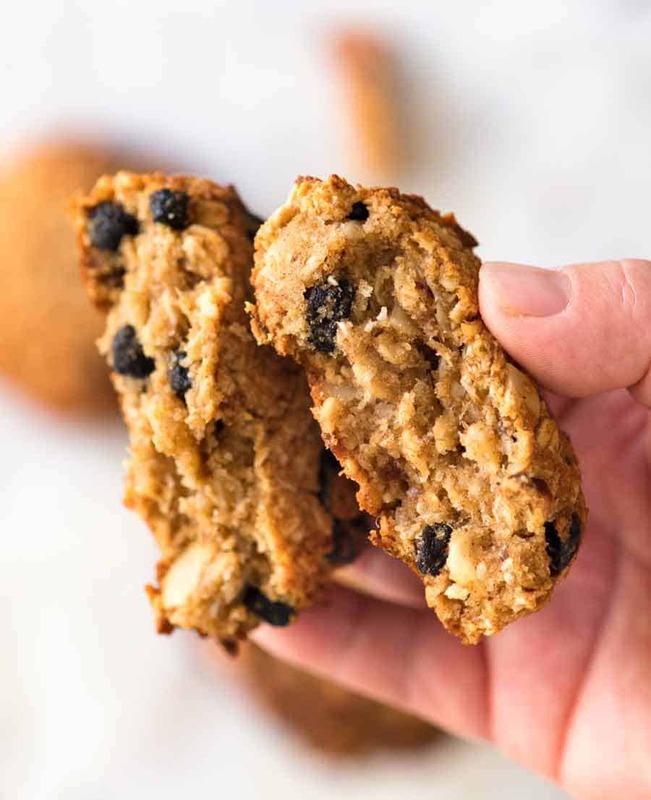 Add Ins: Use 1 1/4 cups in total of your choice of flaked or chopped nuts, desiccated coconut and chopped dried fruit (or small fruit like raisins, cranberries, blueberries) – or CHOC CHIPS!! If you skip the coconut, use at least 1/4 of fairly finely chopped nuts (to ensure cookie holds together properly). 4. Almond meal: aka Almond Flour. Can also use hazelnut meal/flour. Do not sub with normal flour – makes cookie cardboardy. 5. Flavourings: Use whatever you like. For spice: all spice, nutmeg, cardamom, mixed spice. Essence: orange blossom, lemon, caramel, coconut, almond. 6. GLUTEN FREE option – ensure the oats are gluten free. 7. STORAGE: good for 5 days in a super airtight container, though the outside of the cookies do soften, like any homemade cookie. Haven’t tried freezing yet – would love to know if anyone does! Originally published December 2018, updated for housekeeping matters April 2019. No change to recipe! The post Breakfast Cookies (Healthy!) appeared first on RecipeTin Eats.